Ansaldo Energia, working in a consortium with SNC-Lavalin, has been awarded contracts by STEG worth over 300 million euros. In recent years Ansaldo Energia has increased its international sales efforts, particularly in the MENA region (Middle East and North Africa). Despite the political and social unrest that has recently swept through the area, it continues to promise high GDP and population growth rates and, therefore, constantly rising demand for energy. With a population that will reach twelve million in 2020, Tunisia is one of the main countries in the area and strong future growth is predicted here too. After a temporary fall in GDP in 2011 caused by the “Arab spring”, today the International Monetary Institute forecasts average GDP growth of 5% for the next five years. Over the last five years energy demand growth, although stabilising in 2011, has been on a par with top-ranking emerging countries with huge development prospects. Today, a significant proportion of electricity generation is from fossil fuels, mainly gas and oil. At the end of 2011, almost 90% of the installed generating base used gas to produce electric power (source: Enerdata). According to forecasts, conventional thermal sources (mainly gas) will continue to dominate electricity generation in the years to come, while the most popular technology, without the shadow of a doubt, will be combined cycles (CCGT). The government, through the main local utility company STEG (Société Tunisienne d'Electricité et de Gaz), plans to increase its installed generating base by at least 1,200 MW in the period to 2016. Ansaldo Energia, working in a consortium with SNC-Lavalin, has been awarded contracts by STEG worth over 300 million euros. The EPC (Engineering, Procurement and Construction) contract involves the design and construction of a gas-fired combined cycle thermoelectric power plant rated 420 MW in Sousse and an LTSA (Long Term Service Agreement) covering maintenance and assistance services for a period of six years. The plant, called “Sousse D”, will be situated next to “Sousse C”, which the Ansaldo Energia / SNC-Lavalin Consortium is currently building in the Sidi Abdel-Hamid region (Sousse Governorate). The plant will be equipped with an AE94.3 model gas-fired turbine that can also burn diesel oil as a backup fuel, an MT15C-SS steam turbine and the relative THR-L63 generator. These machines were designed and built entirely at Ansaldo Energia’s Genoa production facility. 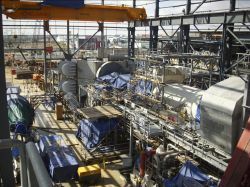 The contract, which forms part of STEG’s ongoing energy production development plan in Tunisia, stipulates plant delivery in summer 2015, with a programme of work lasting 28 months from entry into force.